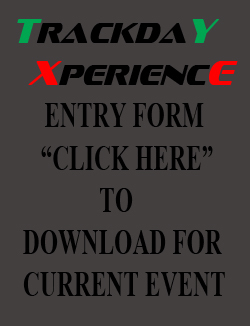 · Trackday Xperience events are by invitation only. The purpose of the event is for drivers to gain experience with their vehicles and advance their driving skills. It is not a competitive motorsport day. There will be no racing or timed events. · You need to bring your own helmet and 100% cotton overalls. All drivers and passengers must wear a helmet and a minimum of 100% cotton overalls when out on the track. · The event will still be run in wet weather. There will be no refunds, however in the unusual circumstances of the event being cancelled due to extreme weather conditions. Driver and vehicle safety will be the priority in making any cancellation decision. · All drivers must attend the Drivers Safety Briefing (NO EXCEPTIONS). If you arrive late we will endeavour to give you a personal briefing as soon as practical. Unfortunately, you will be delayed, you must not drive on the circuit prior to this. · NO ALCOHOL is to be consumed by anyone driving a vehicle. There is NO SMOKING in Pit Lane or in the Main Building . · Meet in the Corporate ( Lester) Suite above the track at 9:00am to confirm your registration and sign an indemnity form. Drivers Briefing will begin 9.30 Sharp. Please time your trip to allow you to arrive between 8.45 and 9:15am. Please drive safely on your way to and from the circuit.